Today we celebrate the feast of the Annunciation to Mary. The angel of God brought her “good news” ~ but news she could hardly have understood at the time. She would bear a child, who would be called Son of the Most High. 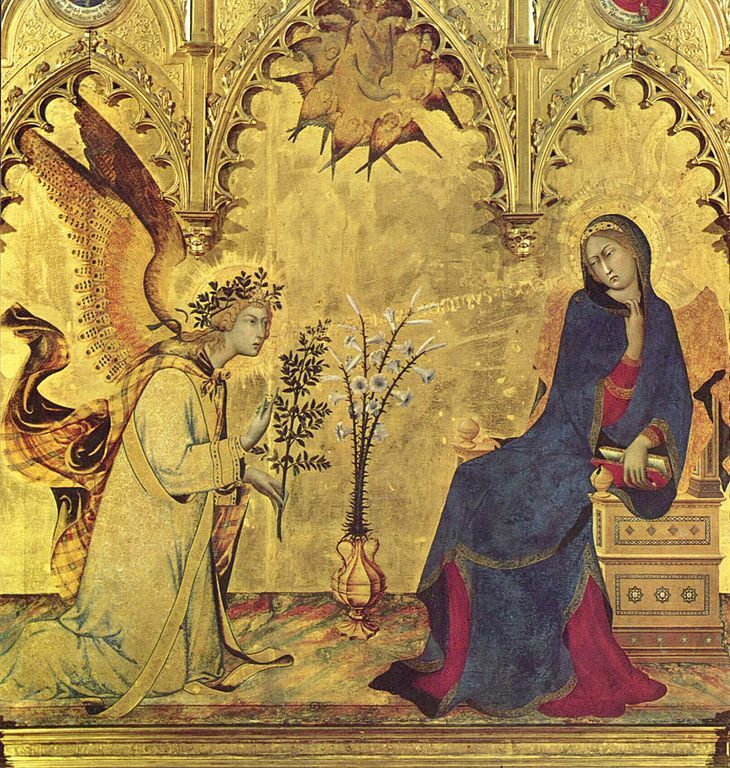 I have always loved Annunciation paintings, and this one by Simone Martini (from 1333), in particular. When the angel appeared to Mary, she encountered God’s holiness and righteousness. Like so many times in history, God’s presence pushes everything else into clarity. The bright light of Glory throws into relief all the dark places in the world – all the hidden corners of our lives. We usually react to this with disquiet and concern. We hear that God’s word comes as Good News. And yet we experience God’s call to become a new person, or do a new thing, as a fearful invitation! For me, it has been a call to move from one beloved congregation to what I could only hope would be another. For both you and me, it will be a call to speak to someone with whom we have a misunderstanding, or forgive someone whom we have failed to forgive. When God calls us to new life, we are often afraid. We think of what we fear might happen: like losing a familiar home and community; or setting aside our pride, and opening ourselves to being hurt again. Look at how Martini portrays Mary’s response to the angel! Gabriel visits her with holy news about the child she will bear, who will bring salvation to the world. Mary draws back from his message, fearful about what it might mean. We know it turns out for good. But at first, God’s call can frighten us. A change to something new, always means a change from where we started.